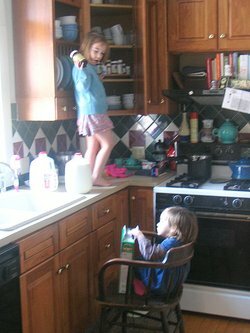 This is how I found my children this morning in the kitchen after I got off the phone with Dan. Emma perched on the counter getting cereal bowls and asking Mary if she’d had her vitamins. Mary making herself at home with her paws buried in the box of cereal. Trust me, this is not the first time I have walked in on a scene similar to this one. Breakfast was followed by a girly fashion show. 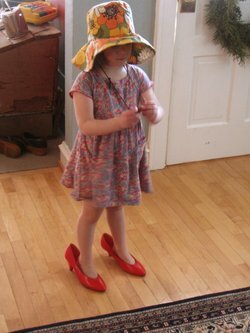 Emma often disappears upstairs, only to come down in some outrageous getup for her big reveal. 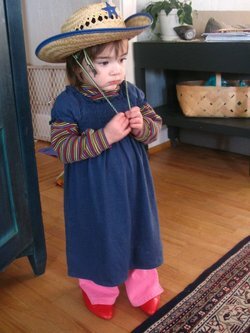 This one was pretty tame as her outfits go. Mary, of course, got in on the action too. Wonderful girls ;o)Love the bright flowery hat! Listen Blair–they’re from Goodwill, I SWEAR!! Don’t be shy Molly, You can tell us all about Dans shoe fetish. You girls are sooooo precious!